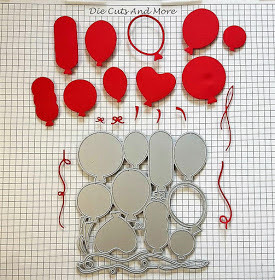 Balloon die set released in February from DCAM. I fell in love with this die set the minute I saw it and knew what I was going to be working on with it. You will see the both of my projects are birthday cards. It worked out well that I had this die to work with, as my mother in law needed a couple of birthday cards to send out this week. For my first card, I used the Balloon, Border and Celebrate Dies to create the front. I ran the Balloon die through my Big Shot 3 times, once for each color used. This gave me a full set of each Balloon shape to have fun with. I had also run it through in white, however, I did not like the white on white background so saved it for my second project. I then carefully laid out the cuts so that I did not have the same color touching when set. The paper used was adhesive backed, so that made it really easy for sticking it down. The Celebrate saying I used a zig glue pen to adhere it down. Let me say, it was fun using these birds again. I have had them in my stash pretty much since they first came out and have only used them a few times, this card just screamed for it. Remember I said above that I used the white balloons on my second project... well this is what I did, using my Stampoholic I stamped two of the birds on the balloons. I then used my Zig Clean Color Real Brush Markers to color the birds. The great thing about this Balloon set is if you notice there is a hollow balloon, well that one matches up to the balloon two over to the left, I was so happy to realize this, as I used the hollow to make the top layer. I used a light dusting of Salty Ocean distress ink for the background on the two balloons. 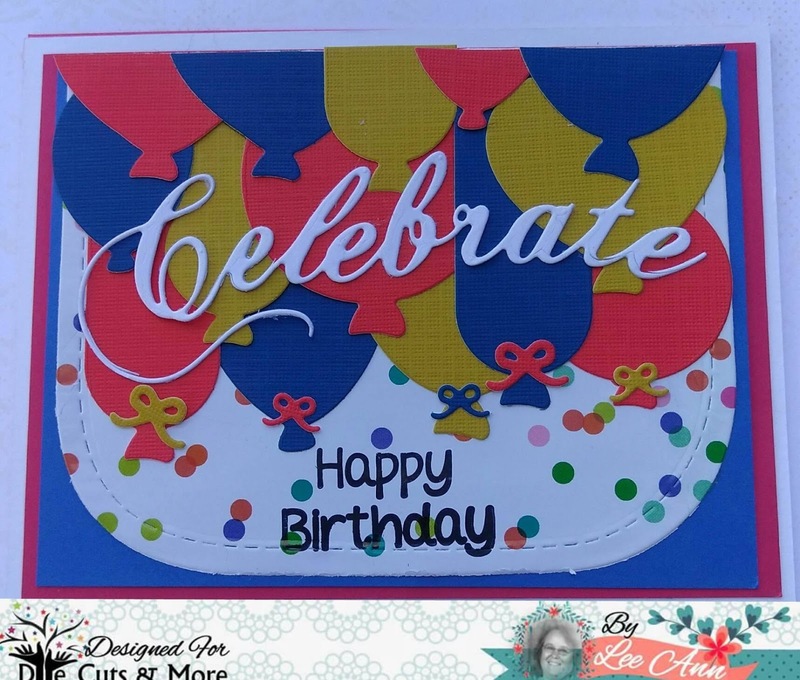 The piece I have the "Happy Birthday" sentiment stamped on is made using the long balloon in the top row of the set, and the red and blue end pieces were made using the bottom long balloon ends. I really had a lot of fun making these cards, and I hope you enjoyed them as well. Thank you so much Claire, I really had fun making them. And these birds really do not see daylight enough. I think those birds, peeping out of the balloons, are delightful! You've made great use of the inspiration colours - they just scream birthday celebration. Thanks so much for joining us at Retro Rubber. You had so much creative fun with that fab die cut! I think you cannot have enough balloons to play with and that die gives you so many. 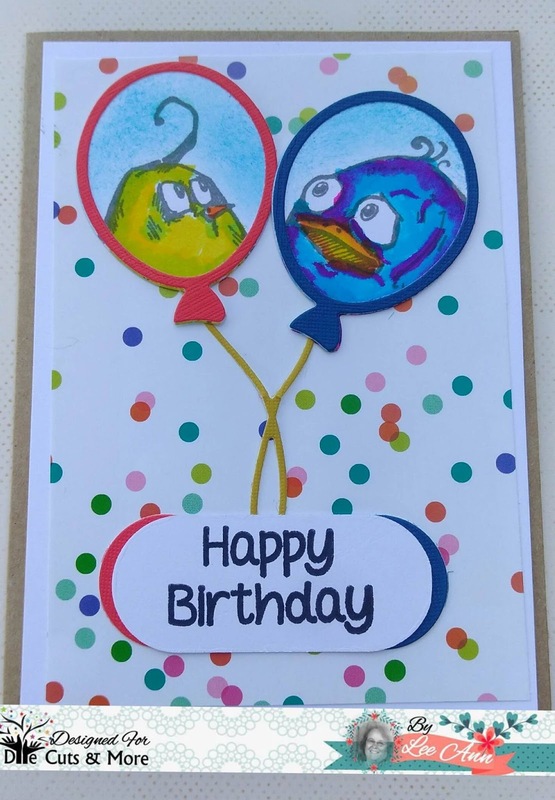 Fantastic card with the adorable birds on the balloons. Thanks for playing along with Retro Rubber's color inspiration challenge and hope you will join us again soon! LeeAnn, you have been having to much fun with this challenge. These cards are adorable! The colors you used go do well with the challenge. Thanks again for playing along with Retro Rubber! Too funny! What a great way to use the crazy birds . . . in the balloons! Thanks for playing along with us at Retro Rubber!